With the end of the 2010 season fast approaching, I wanted to take the time to do one final flashback post covering 2009. By the end of the 2008 season, William had recovered fully from his accident, and regained his confidence. At the 2008 Fall Classic, he rode away with the 2008 SE regional title, and won his first nationals of the 2009 season. Wyatt began racing in 2008, and was making a mark of his own as a 5 rookie. This is also when they were both signed on to their team-- Schanewolf Cycle Sport. Their opportunity to earn additional national points came the following January at regionals in St. Pete. (you recall the bathroom blog?) Even though the facilities were less than desirable, William made a good show coming away with two perfects. It was after this event that we began to ponder the possibility of a national title. William battling for the win in High Springs. Two months later at Spring Nationals in Morristown, TN, William had another perfect weekend, taking him to the top of the 8 novice ranks. With five perfects under his belt, he only needed one more to complete his season, cap his points, and head to the grands on top. This day came a month later at the Gator Nationals in High Springs, FL, where William stayed on his A-game, stuck out his elbows, and took the perfect. Although his points were capped, he continued to race for as long as his move-ups would allow. July nationals in Nashville proved to be a struggle. At the top of his class, William was the kid to beat, and he felt like a target. He cut his losses, and got it together to take a win in Peachtree City the following month. He was ready for the Grands. We headed for Louisville, KY, on the Tuesday before Labor Day, with high hopes and great expectations. Both boys worked hard on the track Wednesday and Thursday before the race, allowing us to take a day off on Friday to explore Louisville with visiting family (see BMX: It's a Family Affair). 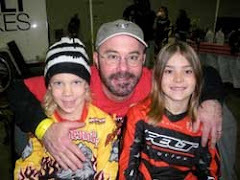 Racing began Saturday morning, and both William and Wyatt easily made it through their first motos and quarter finals. William's nerves took a turn for the worst, however, when semi finals rolled around. To qualify for the main, riders had to place in the top four. A slip of the pedal, a wreck, coming unclipped... all these things were on William's mind. He has a way of over-thinking, and can sometimes work himself into a stress-frenzy. We sent him up to the gate with excessive encouragement and waited anxiously. Let me just say that we have revisited this video 100 or more times, and it still puts my stomach in knots. I asked William what he was feeling in that last turn, and he said, "I don't have a feeling when I'm racing. If you have a feeling, it's harder to do it." Wow. I think that's pretty real, and I think my kid is pretty darn awesome. Wyatt was also "on the bubble" in his semi-- the outside of the bubble. Wyatt, after working hard all season, narrowly missed his main. He did what he always does in these situations: accepted a hug, immediately blew $8 on bungee jumping, and prepared to cheer on his brother. After his shaky semi, William grew even more anxious for his main. We did all we could to calm him. We knew he'd be fine as soon as the gate dropped, but the several hours of waiting was wearing on him. I found myself pleading-- not with God, but with someone I know much better in heaven-- my mom. Please please ride with William. Give him strength and courage. William knows the error he made in turn one. He should've won, and nearly did at the end. Regardless, the story has a happy ending. William's second place grands finish, combined with his cumulative points for the season, still gave him what he was after-- the national title he shed blood, sweat and tears for. For his grand finish, William rewarded himself with a new bow and arrow, that he had said he would only get if he took the number one plate. He bought it with his own money-- a little bargain with himself. I am nervous just watching those motos. Those boys are amazing, just like your beautiful mother. I know she's proudly watching from above.